Wear What Works In The Wet. Joka Glove is $28, mittens also available as are other models. I usually take most of my vacation time in the winter because I like to ski out West and in the Adirondacks. And more often than not, the trips are something to look forward to when you live in the Mid-Atlantic and have to deal with the rain and sleet events that plague our winters here in “the banana belt”. I always tell everyone if you can stay dry, skiing in the rain is not bad since the snow is soft, and the turns are, well, hero turns on hero snow. Enter the Joka Waterproof Glove. If you go to the CHS Snowmakers web site, you will find an array of perhaps the finest waterproof gloves that you will ever purchase for a very reasonable price. Joka gloves are rubber and have an inner, removable fleece liner that can be easily removed and dried. These are true snowmaker gloves and are perfect for skiing in the rain. I have a Pro Gore-Tex from Patagonia that keeps me completely dry, but the Achilles heel has always been wet leather gloves that get soaked and cold. When I found the Joka gloves on a recommendation from a friend, I became a believer and an evangelist. 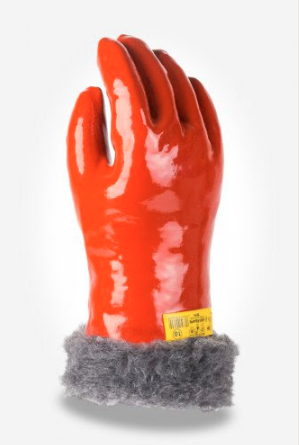 You can literally submerge these gloves up to the fleece lining in a bucket of water and never get wet. Everybody is buying them down here in the banana belt, and you should too if you venture out in weather that is not quite optimal. The other nice thing about the gloves is that you can “squeegee” your goggles without scratching your lenses. When it really rains, I have to reach up and clear the goggles and these gloves are non -abrasive to the goggle lens. A definite plus for expensive goggles that are sensitive to handling. I’ve used a similar glove from Hamilton Marine, made for fishing and lobstering, for years. They are less expensive at around $18.00. Gloves like these are the only thing to wear on a wet day. They aren’t too bulky, and keep you warm and dry. Wet gloves and clothes have never been my problem when rain greets my ski days… it’s the water on my goggles. Visibility is compromised and that’s what cuts my day short. What can I do about that ? Thanks Sherm. Fellow PSIA guy. Karen- like I describe, you can use these rubber gloves as a squeegee on your lenses before each run. That is what I do. Also- if you have high quality goggles, they have a coating that beads water. If not, try RainX. Regards.